U.S. 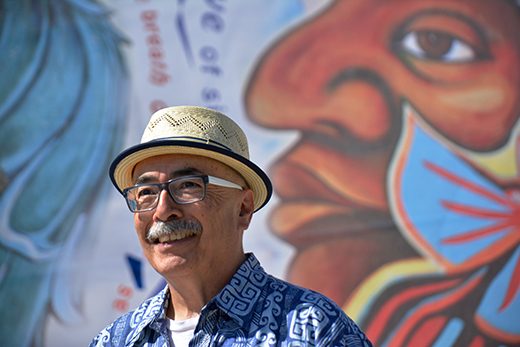 Poet Laureate Juan Felipe Herrera will give a free reading at Emory’s Schwartz Center for Performing Arts at 4 p.m. on Sunday, Feb. 19. Herrera was born in 1948 in Fowler, California, as a son of migrant farmers, and grew up in the southern agricultural communities of the state. He graduated from San Diego High School in 1967 and earned a BA in social anthropology from UCLA, where he became involved in the Chicano civil rights movement. He went on to earn a master’s degree in social anthropology from Stanford University and an MFA degree from the University of Iowa Writers’ Workshop. The author of many poetry collections and children’s books, Herrera is also a performance artist and activist for migrant and indigenous communities and at-risk youth. He has founded several performance groups and has taught poetry, art and performance in community galleries and correctional facilities. He was appointed California Poet Laureate in 2012 and the U.S. Poet Laureate in 2015, the first Chicano to hold the title. Herrera’s reading at Emory is part of the Raymond Danowski Poetry Library Reading Series, now in its 12th season. Herrera is the sixth U.S. poet laureate to be featured in the series, and the 30th reader overall. “Herrera is a gifted poet and a dynamic performer of his work — those attending can expect a unique and electrifying experience,” says Kevin Young, University Distinguished Professor and Charles Howard Candler Professor of Creative Writing and English. An acclaimed poet, Young is also the former curator of literary collections and the Raymond Danowski Poetry Library at the Rose Library. The Feb. 19 event is sponsored by the Emory Libraries, the Rose Library, the Hightower Fund and the Creative Writing Program at Emory. The Schwartz Center for the Performing Arts is located at 1700 N. Decatur Rd., Atlanta, GA 30322. Parking is available in the Fishburne and Lowergate South decks. For event-related information, contact Becky Herring at rlherri@emory.edu.